Since my last accident I’ve been thinking more and more about the safety aspects of cycling. There were no witnesses of the accident in January, so it took a lot of time and effort to prove that the driver actually hit me. I’m pretty sure that we wouldn’t have had any discussions if I had a video of what actually happened that day. At that time I only had one camera, but I forgot to bring my bike mount from Sicily, so when I went out for a bike ride I had no camera on my bike. Because I was hit from behind, a camera on the front would not have been enough to show what had happened or to avoid discussions. That’s why I decided I needed a second camera to film everything behind me. Even though it would probably be not that easy to touch that bolt while cycling, I decided to cover the end of the bolt and a valve cap was a perfect fit! Besides the fact that the mount will ruin your bib shorts (unless you’re cycling with your knees outwards I guess), it’s pretty annoying hitting your mount with every pedal stroke. So it goes without saying that I’ll be looking for a different solution. As soon as I have one, I’ll either update this post or write another one. Edit: I found a solution! You’ll find it below. Now back to my test. The camera manual explains how you can control multiple Virb cameras with your Garmin bike computer. One of the cameras has to be the “main VIRB” and the other camera(s) has/have to be set to “extended VIRB”. I had no problems setting the cameras to main and extended and they connected immediately. 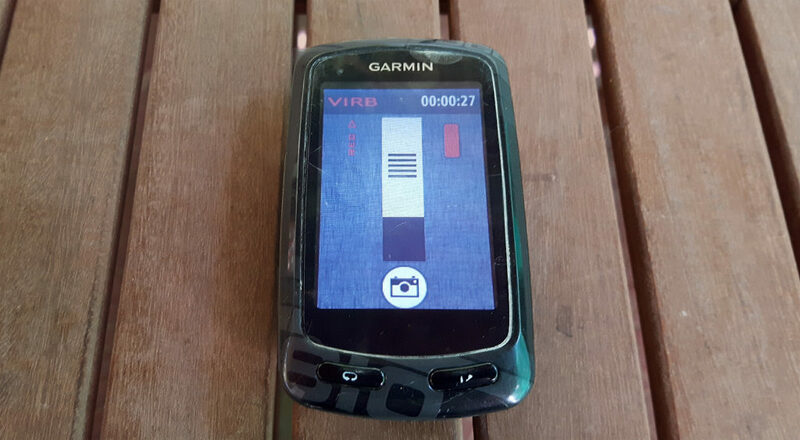 The Virb screen on the Edge bike computer will not change. There’s no second slider or second photo button, because the extended camera will do what the main Virb does, so if you set the main Virb to record, the extended Virb will start to record as well. I have had many issues with Garmin products in the past, but I encountered no problems using two Virb cameras and controlling them with the Edge 810 bike computer. I’ll definitely use both cameras on solo rides. By the way, if you’re also using your cameras as “dash cams”, then make sure to use the lowest resolution (720p for a Virb Ultra 30) and to turn off the extras you don’t need, like Wi-Fi, Bluetooth and sensors, so your batteries will last much longer. Pictures taken using the different mounts. It’s clearly an improvement. I don’t understand why Garmin hasn’t made a mount that is less bulkier and that can be fixed to either the frame or the seatpost. I could always go for a different solution, like a 3d printed version, but for now this is working like a charm!